Every time I think of Albondigas de Pescado (Fish Balls) I cannot help but think of the lazy days of summer. One of the few things I actually like about the season. Summer, summer, summer! It’s everywhere. It’s “summer this”, and “summer that”. Girls in bikinis, over-tanned idiots and kids playing with garden hoses. Will the cliches never end? But I’m going to let you in on a little dirty secret: summer is my least favorite part of the year. If you don’t understand why I just don’t feel as enthusiastic about the whole summer thing, it means that you have obviously never lived in the tropics. And by tropics, I don’t mean southern Florida (however insanely hot it can get there). Grab your maps, kids. We’re going on a tour. There’s a good reason why our national Poet Laureate wrote that ours is “an island under the very trajectory of the sun”, which I’m sure is poetry for “it’s fricking hot here”. This will come as news to nobody. If you only knew one thing about the Dominican Republic, it would probably be that this is a tropical country. With summer comes unbearable heat, merciless humidity and hurricanes. If one goes by the fact that the usual summer greeting around here is some sort of complaint about the heat, it would seem as if we haven’t got used to this fact. I, myself, have been thinking that perhaps I’m having a small case of the menopause since I was a teen. I’m not looking forward to the real thing. If you’re looking for a good summer dish, this is it. Albondigas de Pescado (Fish Balls) cooks in a very short time, and are easy to make. Served with a bit of rice and some fresh salad it makes for a light meal. After all, spending long hours in the kitchen in the summer heat is not really anyone’s definition of fun. Fish balls is one of my favorite ways to make fish, and it is also a great way to make the most of inexpensive fish. 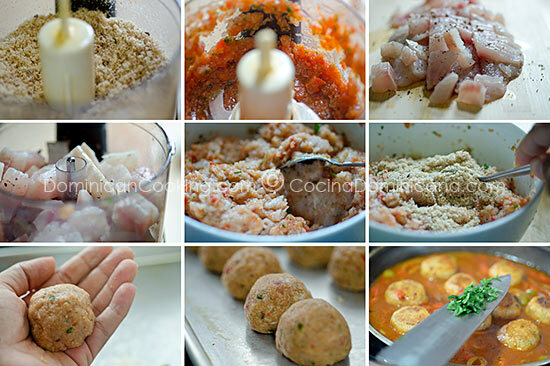 Albondigas de Pescado Recipe (Fish Balls in Tomato Sauce): Summertime and beach flavors on your table! Make this great dish with inexpensive fish. Pulse the bread in the food processor until it has the texture of coarse sugar. Set aside. Mix bell pepper, onion, garlic, parsley, a pinch of pepper and a teaspoon of salt and pulse in the food processor until you obtain a coarse paste. Set aside. Cut the fish into cubes and pulse in the food processor until it turns into a uniform paste. Mix fish, breadcrumbs and seasoning paste from step 2. Mix well. Make the fish paste into balls of about 1 1/2" in diameter. Set aside. Add the onion and cook and stir until it becomes translucent. Add garlic, tomato and bell pepper and cook and stir for a minute over medium heat. Add the tomato sauce, water and olives. Mix well. Very gently add the fish balls, making sure they don't break. Cover and simmer over low heat for five minutes. Turn the fish balls and simmer covered for another five minutes. Sprinkle with the cilantro, season with salt to taste and remove from the heat. Serve with white rice or tostones and garnish with the limes. Nearly any fish fillet available in supermarkets can be used in this dish. Traditionally it is prepared with warm water fish (lower in fat) like bass, grouper or red snapper. what if I tried to do it like a soup style what do you think that would be like?? ?not trying to demolish your awesome recipe just thinking on a cold evening would be awesome!! You could, but beware of changes in texture and flavor. I had a quick question, would I be able to use breadcrumbs if I don’t have old bread. and how much would i have to use to equal 4 slices? Thank you aunt Clara for your receipts of albondiga de pescado, I love it and as you say it is easy to do. OMG, I made this for my family last night, what a hit….it was delicious, I made it with red snapper, rice, and fried green plaintains, avocado salad. I have to say the lemon gives it a kick….definitely a must try. My family and I definitely enjoyed it. I am so glad to hear you family liked it. It’s a great way to “trick” the little ones into eating fish too.